Insects were my earliest predators. As a preschooler, the majority of my outside time was spent in backyards and neighborhood playgrounds. My little friends and I invented ‘make-believe’ universes and spent afternoons cooking invisible pancakes in our invisible kitchens, bossing around invisible students in invisible classrooms, and performing carefully choreographed dances for invisible audiences in invisible theaters. My favorite character to play regardless of the scene was a puppy (though one time I took it upon myself to be a blind cat, and it didn’t end well. I’ll save that for another post.) How, you might wonder, does a puppy wind up in a kitchen? In a classroom? In a theater? I don’t know, and it never seemed to matter. For some reason, I liked the idea of not only pretending to be a human in another context, but embodying a cute animal that got to have just as much fun. Like any good dog, I often roamed the invisible universes on my paws – hands and knees. In doing so, I learned that even the best make-believe dogs are susceptible to real-life bugs. One time my dog character needed to spy on invisible aliens landing on the other side of the backyard fence, so I stood on a mound of grass built up at the base of the wooden slats to get a better look. The mound turned out to be a nest of yellow jackets; in an instant, I was one unhappy pup surrounded by a cyclone of vicious bees, howling for help, and frantically trying to get rid of that awful feeling of bees buzzing under my clothes. Another time my dog character was an Olympic gymnast, shimmying up a slanted balance beam at the playground. My paw reached under the beam for a better grip and crushed a family of bees in the process. More bites, more howling. Despite my not-so-friendly encounters with bees, I’ve grown to appreciate their place in the world. They are expert pollinators and eaters of other, more annoying, bugs. Without honey bees, the recipe described here would not have been possible. It is with these good qualities in mind that I was sad to read about the recent expansion of Colony Collapse disorder, which has killed almost 50% of the country’s bee hives used for pollinating crops this year. I wish these bees all the best in escaping from their very own mystery predators. 2. Toss halved brussels sprouts in olive oil, salt, and pepper. Roast for about an hour, until beginning to crisp and brown (more or less depending on your oven and how crispy you like the sprouts). 3. 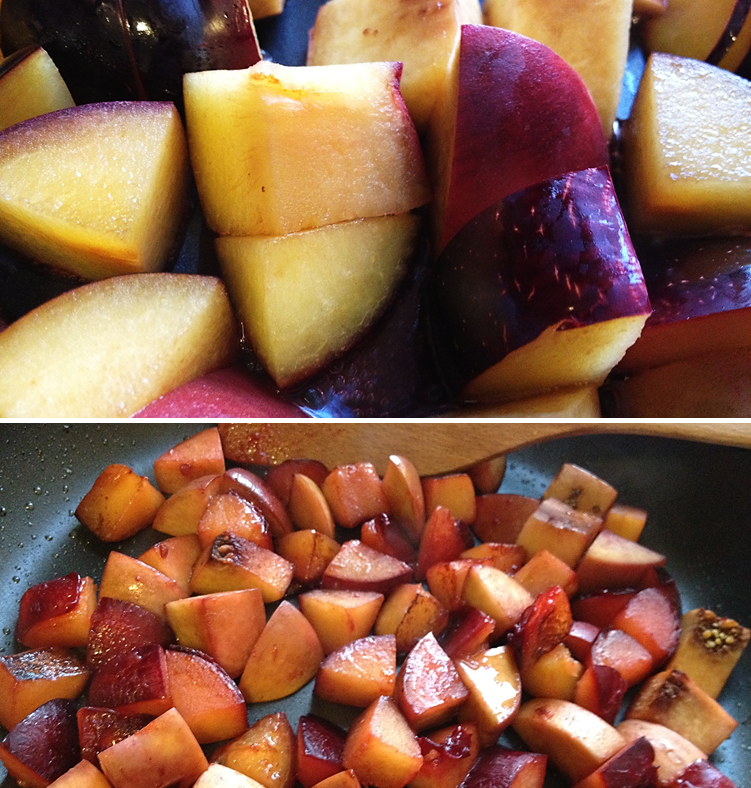 Saute plum pieces over medium heat until tender but not mushy. 4. Whisk together honey, balsamic vinegar, olive oil, and salt. 5. 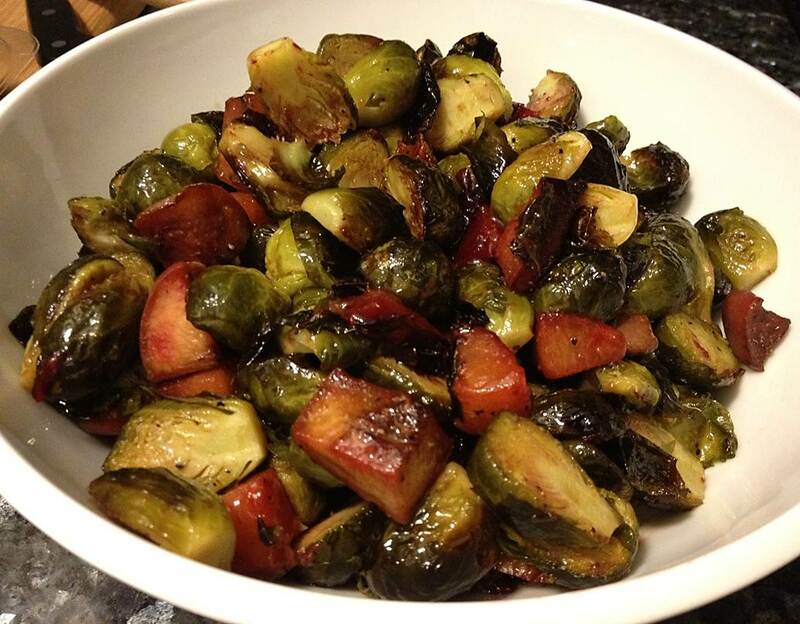 Combine brussels sprouts and plums. Gradually mix in glaze to taste (I tend to use a little less than I make to get just enough but not too much sweetness).